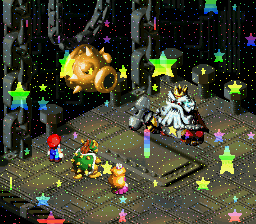 Meteor Swarm is a powerful attack from Super Mario RPG: Legend of the Seven Stars used by bosses near the end of the game. When the attack is used, rainbow-colored stars fly from the top-right corner of the screen to the lower-left. This page was last edited on May 22, 2017, at 18:23.